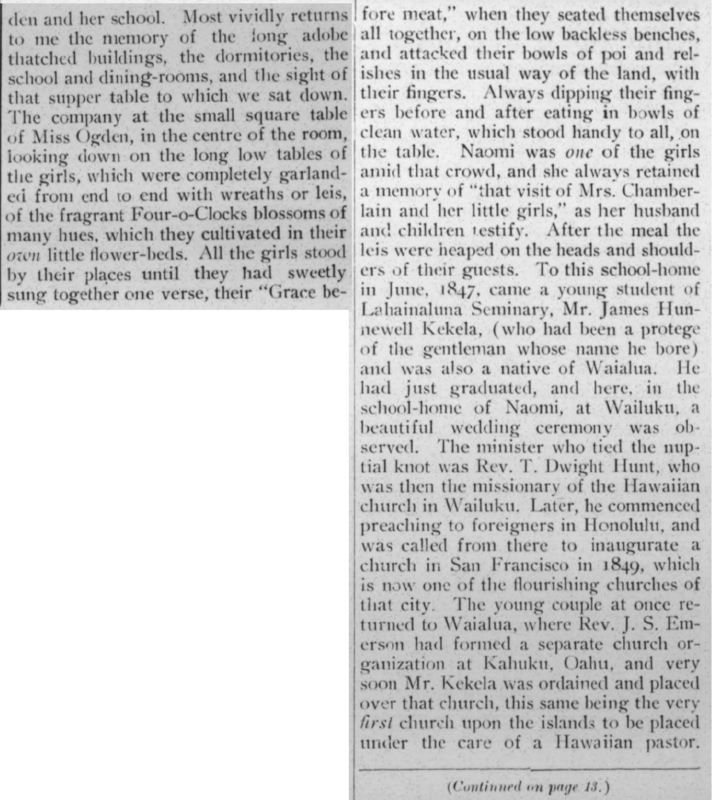 James Kekela reports from Tahiti, 1890. NEWS FROM THE ISLANDS IN THE SOUTH. The letter below is by Rev. James Kekela to Dr. C. M. Hyde, and we were given permission to publish it. Much aloha to you and your wife, and your children. It has been a long time that we have not associated through letters. All of us Hawaiian Missionaries are in good health here in the Archipelago of Nuuhiwa, except for the wife of S. Kauwealoha, she is somewhat weak and frail; she was like this for the past four months, but she has gotten a little better now; I saw them in Uapou during the first week of this past July. I am here these days in Papeete to fetch her (my youngest daughter) to bring her back to be a teacher at the French language school in Hivaoa for the Nuuhiwa girls. This daughter of ours has been living in Tahiti for 4 years and she is prepared to teach the French language. She was approved by the teachers and the French government officials here in Tahiti. In the last days of June, I left Puamau and travelled to Nuuhiwa and reached there, where the boat [? kusie] had left for Tahiti, and I went for a bit to Uapou to meet with S. Kauwealoha them for a whole week and returned to Taiohae in Nuuhiwa to wait for the ship from California. 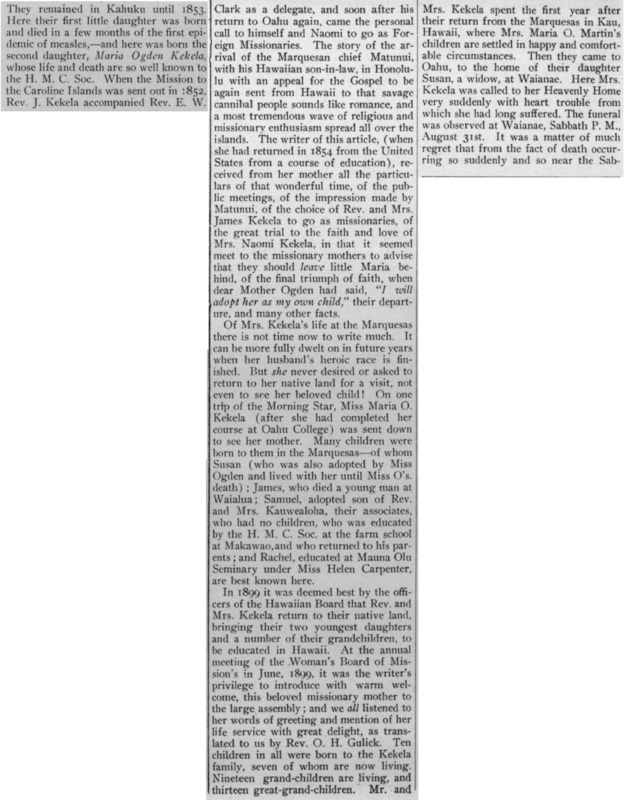 More on the life and passing of Naomi Kekela, 1902. MRS. NAOMI KAENAOKANE MAKA KEKELA. The Friend, Volume LX, Number X, Page 6. October 1902.
den and her school. Most vividly returns to me the memory of the long adobe thatched buildings, the dormitories, the school and dining-rooms, and the sight of that supper table to which we sat down. The company at the small square table of Miss Ogden, in the centre of the room, looking down on the long low tables of the girls, which were completely garlanded from end to end with wreaths or leis, of the fragrant Four-o-Clocks blossoms of many hues, which they cultivated in their own little flower-beds. All the girls stood by their places until they had sweetly sung together one verse, their “Grace before meat,” when they seated themselves all together, on the low backless benches, and attacked their bowls of poi and relishes in the usual way of the land, with their fingers. Always dipping their fingers before and after eating in bowls of clean water, which stood handy to all, on the table. Naomi was one of the girls amid that crowd, and she always retained a memory of “that visit of Mrs. Chamberlain and her little girls,” as her husband and children testify. After the meal the leis were heaped on the heads and shoulders of their guests. To this school-home in June, 1847, came a young student of Lahainaluna Seminary, Mr. James Hunnewell Kekela, (who had been a protege of the gentleman whose name he bore) and was also a native of Waialua. He had just graduated, and here, in the school-home of Naomi, at Wailuku, a beautiful wedding ceremony was observed. The minister who tied the nuptial knot was Rev. T. Dwight Hunt, who was then the missionary of the Hawaiian church in Wailuku. Later, he commenced preaching to foreigners in Honolulu, and was called from there to inaugurate a church in San Francisco in 1849, which is now one of the flourishing churches of that city. The young couple at once returned to Waialua, where Rev. J. S. Emerson had formed a separate church organization at Kahuku, Oahu, and very soon Mr. Kekela was ordained and placed over that church, this same being the very first church upon the islands to be placed under the care of a Hawaiian pastor. The Friend, Volume LX, Number X, Page 11. October 1902. They remained in Kahuku until 1853. Here their first little daughter was born and died in a few months of the first epidemic of measles,—and here was born the second daughter daughter, Maria Ogden Kekela, whose life and death are so well known to the H. M. C. Soc. When the Mission to the Caroline Islands was sent out in 1852, Rev. J. Kekela accompanied Rev. E. W. Clark as a delegate, and soon after his return to Oahu again, came the personal call to himself and Naomi to go as Foreign Missionaries. The story of the arrival of the Marquesas chief Matunui, with his Hawaiian son-in-law, in Honolulu with an appeal for the Gospel to be again sent from Hawaii to that savage cannibal people sounds like romance, and a most tremendous wave of religious and missionary enthusiasm spread all over the isalnds. The writer of this article, (when she had returned in 1854 from the United States from a course of education), received from her mother all the particulars of that wonderful time, of the public meetings, of the impression made by Matunui, of the choice of Rev. and Mrs. James Kekela to go as missionaries, of the great trial to the faith and love of Mrs. Naomi Kekela, in that it seemed that they should leave little Maria behind, of the final triumph of faith, when dear Mother Ogden had said, “I will adopt her as my own child,” their departure and many other facts. Of Mrs. Kekela’s life at the Marquesas there is not time now to write much. It can be more fully dwelt on in future years when her husband’s heroic race is finished. But she never desired or asked to return to her native land for a visit, not even to see her beloved child! On one trip of the Morning Star, Miss Maria O. Kekela (after she had completed her course at Oahu College) was sent down to see her mother. Many children were born to them in the Marquesas—of whom Susan (who was also adopted by Miss Ogden and lived with her until Miss O’s death); James, who died a young man at Waialua; Samuel, adopted son of Rev. and Mrs. Kauwealoha, their associates, who had no children, who was educated by the H. M. C. Soc. at the farm school at Makawao, and who returned to his parents; and Rachel, educated at Mauna Olu Seminary under Miss Helen Carpenter, are best known here. The Friend, Volume LX, Number X, Page 13. October 1902.
bath no foreign pastor could attend the funeral, but the two native pastors, Rev. Messrs. Kaaia and Kekehuna [Kekahuna] made the services most appropriate and memorable. The Friend, Volume LX, Number X, Page 14. October 1902. Mrs. Naomi Kekela passes away, 1902. MRS. NAOMI KEKELA PASSES ON. At 2 p. m. on August 30, 1902, at the home of Mrs. Susan Kekela, one of their daughters in Waianae, the angel of death came to take the spirit of Mrs. Naomi Kekela, and left behind her cold body in sadness. The procession took place from the home where she died until the church, at 3:30 p. m., the services were held. It was the father Rev. J. Kekahuna who concluded the services for the deceased, and the earth returned to earth, as the saying goes: “You are earth, and you shall return there.” And Mrs. Naomi Kekela lay at the cemetery of the church of Waianae, and on the last day, Jesus will return, and everlasting beauty will be resurrected, made ready for his people who he chose from amongst this world. 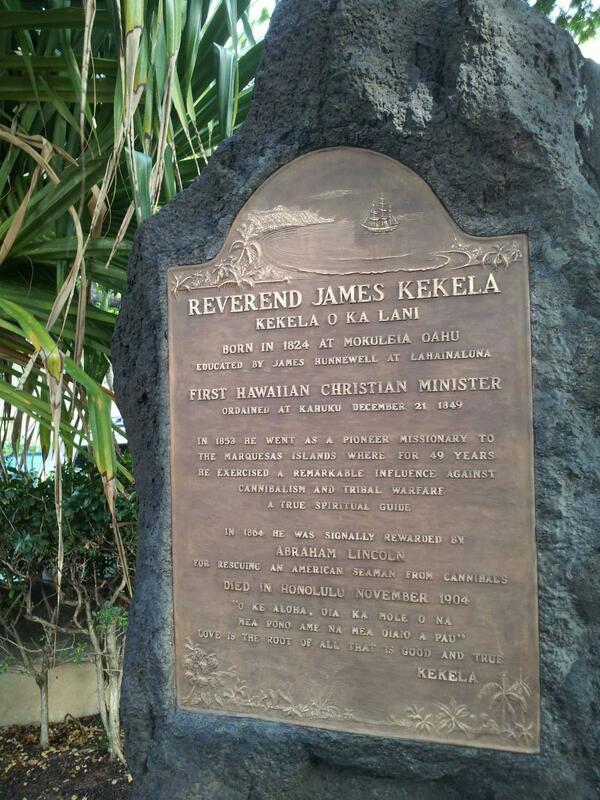 With this, know, O faithful, and friends from Hawaii to Kauai, Mrs. Naomi Kekela is one of the first female missionaries from amongst Hawaii’s own women, sent to the Archipelago of Nuuhiwa for foreign service, by the Hawaiian Board of Missionaries [Papa Hawaii]. The two of them lived in that land proclaiming the light of life through Jesus, for 40 years or more. They returned to Hawaii to retire. Left behind is her beloved husband, Rev. J. Kekela, and 4 daughters, and her grandchildren. There are a number of children and grandchildren in Nuuhiwa who are grieving here [there?] for their dearly beloved mother. Mrs. Naomi Kekela was afflicted with a painful illness of the chest, and it is this pain that sapped her strength, and she went on the path of no return. The Lord will ease His devout from sadness until He returns. Ka Nupepa Kuokoa, Buke XL, Helu 37, Aoao 5. Sepatemaba 12, 1902. Introduction to the reminiscences of Hawaiian missionary James Kekela, 1901. On the 22nd of May, 1821, at Mokuleia, Waialua Oahu, born of Awilinui and Kauwanui, his wife, was a big well filled-out baby with the blessings of the Heavens, and child was called by the name Kekelaokalani. This was the thirteenth of their children. Twelve were born prior, and with the [unclear phrase] of that fine offspring. It was here that that child was raised until he was capable of understanding things for himself. In the year 1832, Emerson, Sr. [Emekona Makua] arrived in Waialua, and in the following 1833 [unclear] he built a schoolhouse with his wife for the young men and women to enlighten them with knowledge. From among the first women to be taught there at that school was Kahaweli, the younger sister of the mother of that child. And following her, his mother as well attended the school until she was educated; and she began teaching the children the alphabet [Pi-a-pa], the beginnings of knowledge. It was this mother who guided him at that time in the knowledge about God and Sunday School, and it was thus that the sacred work of God was instilled a top the fontanel of the head [piko o ke poo] of this child, which is silver now, as in the picture above. When that child was thirteen years old, being that he had received the beginnings of the light of true knowledge, he began to travel the width of the plain of Mokuleia for Waialua, with patience and without exhaustion, to receive the good teachings of the elder Emersons. In this year, those fine elders got great help in the form of Mr. Rose (Loke), a haole teacher. After one year of attending this school, Emerson went to Lahaina, and from there he told Kekelaokalani to come to Lahainaluna. In August 1838, he entered Lahainaluna, and there he patiently remained for five years and he graduated in the year 1843. During those years at Lahainaluna, he learned everything about the true knowledge, as well as actual knowledge; and he remained, following the rules of the school, and as a result of his following the rules, he gained the full trust and total faith of the teachers. After his days of learning were over, and he received his Diploma [Palapala Hoomaikai], Emerson, Sr. encouraged him to join the school for the clergy [Kula Kahunapule] that was started that very year. There were six students at the time, and Emerson wanted greatly for him to join. And because of the guidance of the righteous Spirit, he agreed, and so began his actual performing of the work of God. He spent four years at this work, and graduated with a Diploma from the teachers, in the year 1847. When he received his Diploma, he married Miss Naomi, one of the educated young women of the time, and was living under the instruction of the teachers of the Girls’ School of Wailuku, Maui. After they were wed, he was sent to teach the Word of the Lord in the District of Kahuku, Oahu, and there he began his work with patience, with the word of life. And he thus patiently continued as but a preacher; and when his readiness and progress was seen, he was ordained at his own parish. From then until 1852, he strove to convert the Koolau Cliffs, and the fruits of his patience were many. When the head Missionaries saw his progress of his work, he was sent by the first Evangelical Convention held here on Oahu in the year 1852 as a Representative to travel to the places suitable to build parishes of the Lord in the Micronesian Islands. 1. 1852—Went and returned that same year. 2. 1853—Went and returned in 1858. 3. 1859—Went again and returned in 1879. 4. 1880—Returned to his parish until this past year 1899, and came back, in feeble health. ¹Kekela was based in the Marquesas Islands, and not the Micronesian Islands. Ka Nupepa Kuokoa, Buke XXXIX, Helu 3, Aoao 5. Ianuari 18, 1901. After fifty years of the Rev. James Kekela and his wife carrying out missionary work, and after forty-six years of them telling the Gospel of Christ [Euanelio o Karisto] in the Marquesas [Makuisa], here they are returning to spend the rest of their days here in their homeland. Their good works which they have done have spread wide. Kekela was honored by Lincoln when he tried to save the life of an American officer [Jonathan Whalon]. Kekela, Kauwealoha, and Hapuku civilized the ignorant of the Marquesas, and their fame has spread to Tahiti and the colonies of France in the South and East Pacific. Kauwealoha has no children, and will live there until he dies; but for Kekela, he has a big family, and according to his friends, he is bringing back a part of his family to the land of his birth. Ke Aloha Aina, Buke V, Helu 7, Aoao 5. Feberuari 18, 1899.